It's time for a new scintillating feature, in which Lee and I take matching photos of unexpected stuff. I bet you never thought of a spoon and razor. Let this be a message to you. You can look forward to next #TwinTuesday now. So, since it's #TwinTuesday, it's clear I made it through Monday, and now I have to really get my act together and be productive. I need to get the independent reading mini projects graded. I just want to assign all As. That's fine, right? It seems fair. We did it. We camped. I cooked over the fire. There was minimal fighting and whining. We made priceless, precious memories, people. I came home and madly tried to catch up on life here, what with the laundry and the lesson planning. Looks like I might make it through the week. We'll see. The boys and I are going camping this weekend. 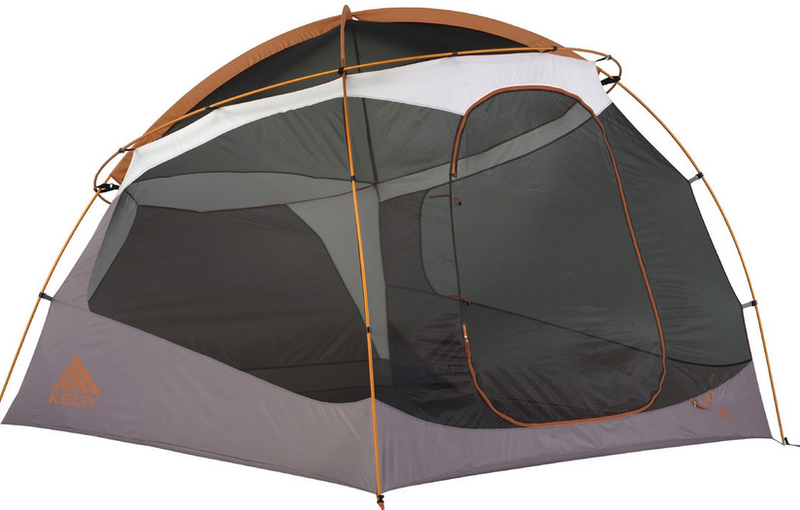 We'll be staying in this very tent. Right now I have to pack the car. There are a lot of supplies needed for a weekend camping trip. I'm thinking it'll be the best time ever, but I'm also thinking I should lower my expectations. You're probably wondering what happened when I implemented my new advisory format on Monday. It was the one where we sing folk-type songs, read a poem, and then go about our business. I told the kids the plan, handed out the three-pronged folders in which we'll keep the songs, just as they do in Thirdlandia. One guy was like, "It's flashback to second grade!" I got some deets, and sure enough, the second grade teachers are loving the singing. "What about after that?" I asked. "Didn't your classes sing in third, fourth, or fifth?" NO?! Well, it's a good thing we're singing in sixth. We loved "Building Bridges." We even got it into a round. I think we'll practice it again on Friday. All weekend Lee and Husbandman have been telling me about famed Swedish hip hop sensation Movits! Basically, I couldn't wait to see Movits! We saw lots of other bands first - The Revelers (5 stars), Full Set (3.5 stars), Aurelio (3.5 stars), Las Cafeteras (4 stars), Mames Babagenush (5 stars), and even more. But Movits! There would be towel-swirling, jumping, familiar beats that carried from song to song without unnecessary variation. Lucky for me, we ended our Lotus experience with Movits! I got really into it. I danced super hard and laughed my head off at myself. Perfecto Movits! Bravo! and Encore! Same song, different verse! I've received some important feedback from Lee. It seems she's been dissatisfied with my blog. Specifically, she feels that I lag in posts. My publishing frequency is inadequate. She has a fever. And the only prescription is more blog. I feel like this is something Pronto would say, but I'm also going to say it: I can understand how someone would crave more Savvy. I'm here sitting across with Lee and Husbandman. Seriously! Isn't that crazy? I'm sitting in their living room with my feet on their couch and drinking their coffee. Yesterday, I went to Thirdlandia with Dr. H., and I'm so flipping serious: It's every bit as fabulous as I imagined it to be. There was singing, there were lit circles, there were multi-paragraph essays written by every single 8 year-old in the classroom. There was this genius system for readers' workshop where the kids had choices and accountability. Basically, Thirdlandia's population is sublime. I recommend this place heartily. I tried to help a little in there, but I was pretty useless. One thing I tried to do was coach a little guy on not sneezing so disruptively, but he said, "I cannot do that." Oh, well. That's why we leave things to the experts. 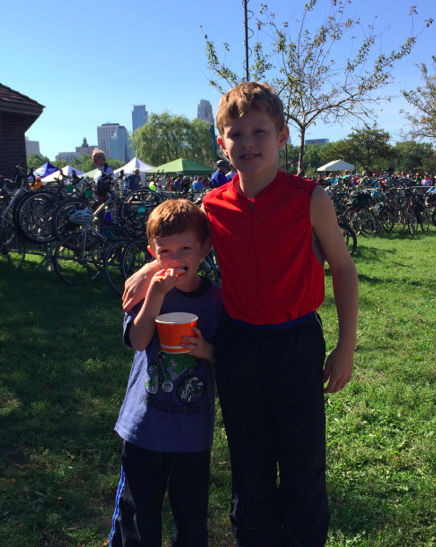 Here are two cute kids at the finish of the Minneapolis Bike Tour. It was another 16 mile ride. I rode with Shef on this beautiful fall day. Dan rode with Mac. Unfortunately for Dan, Mac cried for miles 3-6. I'm not sure why he was crying because this bike tour was actually his idea. "Do you want to do another bike tour?" I asked. "Yes!" he said. "I want to ride with Dad this time." But then he cried for awhile. Later, he decided to continue. 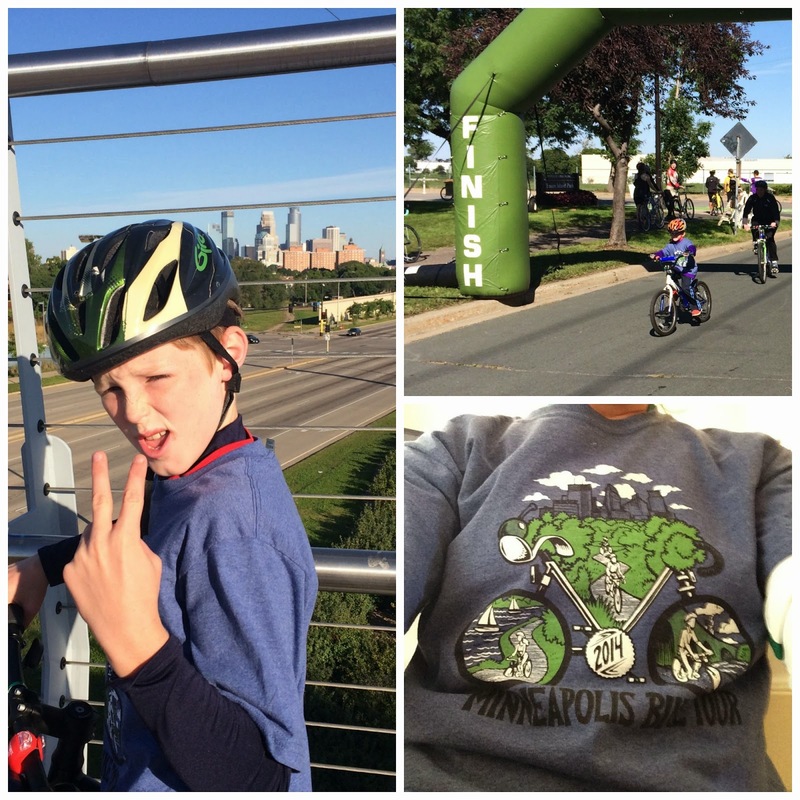 Of course, at the finish, he was proud and pleased to have done it. So I rewarded him with fro yo. We had that curriculum night last night, and then this morning I had my yearly physical at 7am. When the nurse called to remind me, she said in NO UNCERTAIN TERMS that I should fast for 12 hours before. This really bummed me out for many reasons, including the fact that I couldn't have coffee in the morning after doing curriculum night the evening before. But, I mostly followed the rules (except I ate and drank until 10pm because of curriculum night). Come to find out when I got to the appointment that the doctor was all, "Oh, I don't need a cholesterol test this year, seeing as you're in fantastic shape and have healthy habits." That might not have been the exact quote, but it's the exact message. I fasted for nothing at all. First, my barre teacher went crazy with insane workout moves. Whenever I decided to kind of give up, she would somehow telepathically know and yell, "Don't even THINK about it!!" Those moments reminded me of labor. As in, labor and delivery. Second, I got home from barre and was greeted by Crabby Mac. He was very upset that Dan said he couldn't have dessert without eating at least one vegetable. You can imagine how excited he was to then participate in mandatory violin practice. At the end of it, it was clear he needed to go to bed. "You need to tell Dad goodnight. You haven't been very pleasant with him this evening." "But I'm not very pleasant ever," he said.